CAPE CANAVERAL, Fla. — Most space launches from the Sunshine State can be seen by thousands or even millions of people. 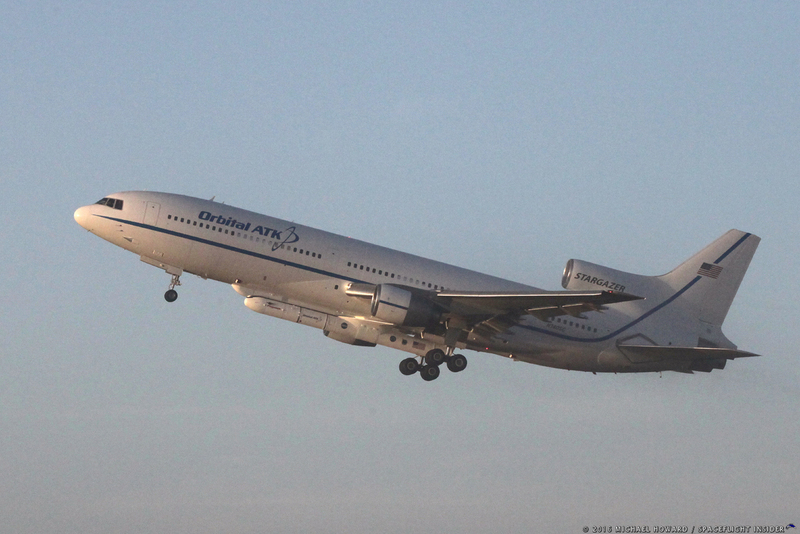 However, at 8:37 a.m. EST (13:37 GMT) Dec. 15, Orbital ATK launched a Pegasus XL rocket by air-dropping it from a modified Lockheed-Martin L-1011 Stargazer aircraft about 100 miles off the coast of Florida. The flight occurred four days after the original launch attempt. The Dec. 12 attempt was ultimately called off due to a malfunctioning circuit board that controlled a hydraulic pump relating to the release mechanism. The mission was then scheduled to get underway on Wednesday, Dec. 14, but that too was called off due to “flight parameter” issues. The team needed an extra day to upload and verify new software. Inside the payload fairing were eight satellites that are part of the Cyclone Global Navigation Satellite System (CYGNSS), a constellation dedicated to monitoring tropical cyclones. The spacecraft will use GPS signals to both determine their orbital location as well as to observe hurricanes. By observing GPS signals reflected from the ocean surface, wind speed can be determined by how clear the returned signal is. Wind speed is one of the key indicators of the strength of a storm. Ruf said that the CYGNSS team is hoping the ability to forecast how strong a hurricane is going to be when it makes landfall will get much better with the data returned by the mission. Air-launching rockets from under larger aircraft is nothing new. It goes back at least to the 1940s and the breaking of the sound barrier by Chuck Yeager in the Bell X-1. Another famous rocket-powered plane dropped by a carrier aircraft was the North American X-15. Air launching has also been used for cruise missiles. However, until 1990, no one had launched a payload to orbit using this method. It is currently the method employed by Virgin Galactic for its suborbital SpaceShipTwo, as is planned for its LauncherOne vehicle. 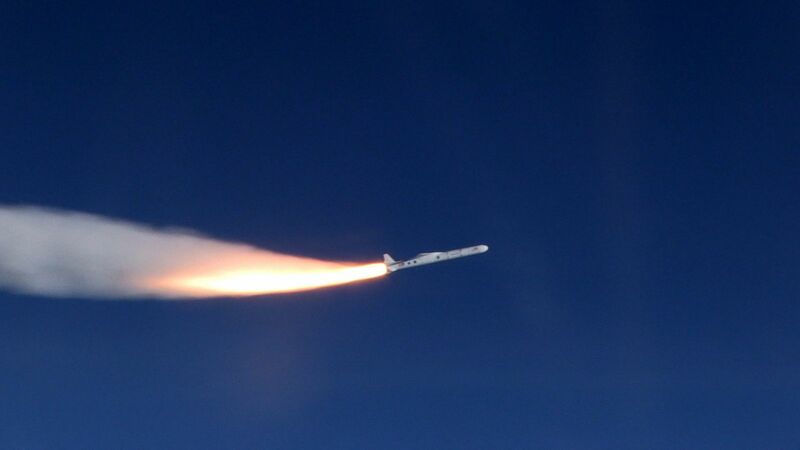 Orbital ATK’s Pegasus, however, has led the pack with this approach to launch services, one that aids in cutting the costs of getting payloads to their intended orbital destinations. Air launching provides several advantages over straight-off-the-ground vertical liftoffs. For one thing, it gets the rocket above the thickest part of the atmosphere at Earth’s surface, reducing aerodynamic friction and buffeting. Getting above this problem, the air-launched Pegasus also can carry a much lighter propellant load. The three-stage winged 56-foot (17-meter) long Pegasus XL boosts small satellites weighing up to 1,000 pounds (450 kilograms) into low-Earth orbit (LEO). 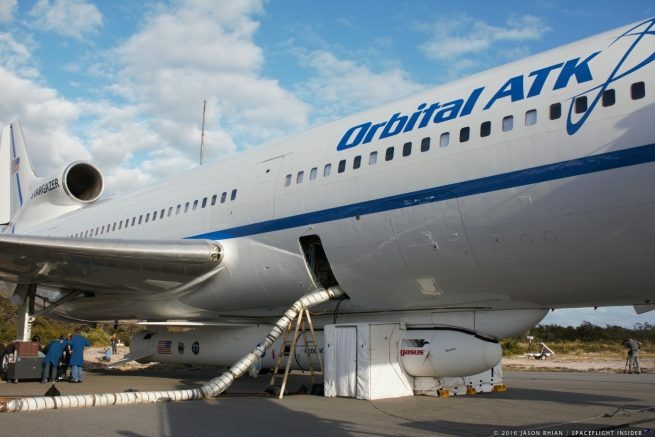 The Orbital ATK Carrier Aircraft (OCA) flies Pegasus to approximately 40,000 feet (12,000 meters) over open ocean, where it is released to free-fall in a horizontal position for five seconds before igniting its first stage solid rocket motor. Two additional solid motor stages take the payload the rest of the way to orbit. 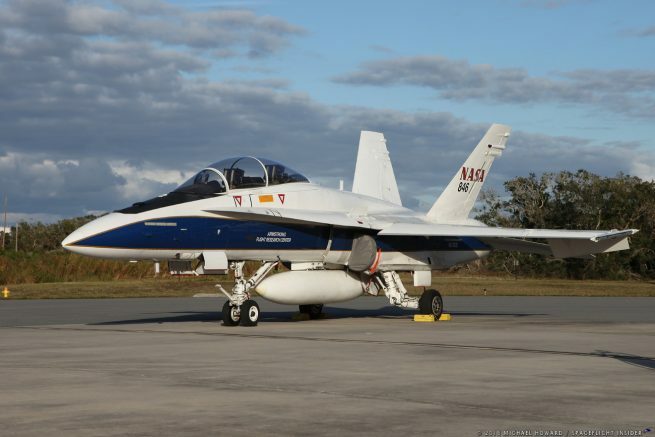 Once airborne and at the drop zone some 100 miles off the coast, the L-1011 and a NASA F/A-18 chase plane moved into position, heading in east-southeast to align Pegasus for its inclined orbit over Earth’s tropics – from 35 degrees north down to 35 degrees south latitude. With all the pre-launch checks completed, the OCA released Pegasus from its belly pylon and the rocket dropped; its first stage igniting 5 seconds after release. The orange flame propelled the rocket rapidly ahead of the OCA before angling upward into the sky above the Atlantic. The Pegasus solid rocket motors have a relatively short burn duration. For the CYGNSS mission, the first stage burned out in 65 seconds before dropping into the ocean, taking the wings with it. Above most of the atmosphere by that point, the rocket could continue without major aerodynamic control. The second solid stage ignited and burned for 161 seconds into the flight, after which the payload fairing covering CYGNSS jettisoned. After a four-minute cruise, the third stage ignited successfully and completed its burn at T+11 minutes, 3 seconds. In orbit, CYGNSS used a unique deployment module (DM) built by Sierra Nevada Corporation (SNC), which serves as the constellation carrier during launch and then deploys the observatories into their proper configuration once on orbit. The DM consists of two cylindrical sections or tiers, each with four mounting/separation assemblies, which are positioned 90 degrees apart to release the observatories in pairs opposite each other along the constellation’s chosen orbital path some 317 miles (510 kilometers) above Earth. As the DM continued along its orbit, it released two satellites at a time, rotating as it went along to keep the eight satellites separated optimally for their mission. 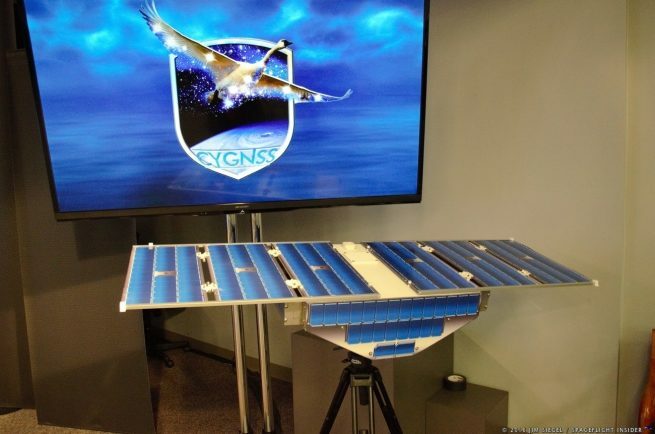 Each of the microsatellites deployed its solar panel “wings” as they separated from the DM, giving them a swanlike appearance (creating part of the constellation name, Cygnus the Swan. With all eight satellites successfully deployed, the rocket portion of the mission concluded. The launch marked Orbital ATK’s 43rd overall Pegasus flight, 40 of which have been successful. Science operations are expected to begin in the second month after launch. The spacecraft’s view (swath) will be about 15 miles (25 kilometers) wide and hundreds of miles long. While following similar orbits, the satellites will be spaced at different intervals so that a single storm will be observed in a series of 15-mile “strips” over the space of a few hours. Because of their small size, the constellation’s individual members do not carry onboard propellant and so cannot be “tasked” to investigate specific storms. However, the constellation’s 90-minute flyover rate for each satellite, multiplied by eight spacecraft, will ensure a good data sampling rate for 70 percent of the satellites as a mission minimum. 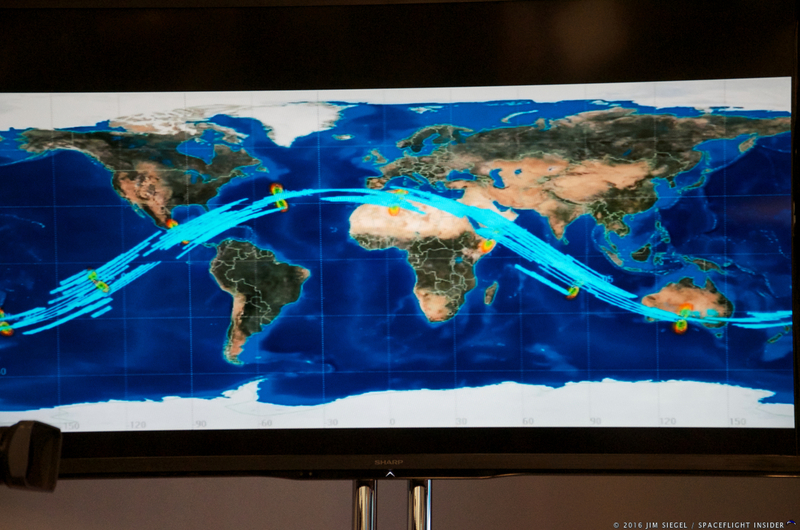 In general, a particular point in the tropics can expect a CYGNSS spacecraft to fly over every seven hours or so. Not having a propulsion system is one of many design choices the CYGNSS engineering team chose in order to save money. While each spacecraft is not expected to change its orbital inclination, it can change its speed slightly by angling the whole craft with regard to its forward motion. Even at that altitude above Earth, there are still enough air molecules to create drag. To slow down (and to help space each craft equally over the course of the whole orbit), the vehicle is turned with its solar panels facing its forward motion. Another cost-saving measure was the number of satellites in the constellation. Aaron Ridley, a CYGNSS constellation scientists, told SpaceFlight Insider Pegasus would have allowed one, maybe two more spacecraft. However, adding more mass would cause the mission to approach the limit of the rocket, as well as the budget. Additionally, Ruf said that when engineers design satellites, there is often a desire to make them as reliable as possible. That is done by adding redundant systems. Ruf also said that with an individual CYGNSS satellite, very few parts are redundant, which is another reason for having eight satellites.